After surviving polio, which deformed his legs and feet, Saming Thongsupan thought he’d never even walk properly, let alone play football. But the 19-year-old Sattahip teen does just that, and quite well. Thanks to tremendous will and strenuous training, Saming has become a popular figure on the football pitches at the Taothan and Thepprasit temples, both for his play and the inspiration he gives to other physically challenged and poor youths. 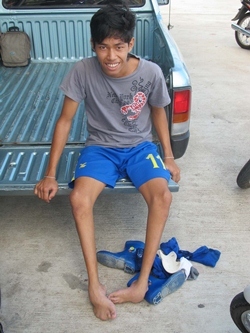 Known by friends as “Ming,” the Ubon Ratchathani native said he was born with syndactyly, or webbed toes. He said he also suffered from polio as a boy, which deformed his legs. Through intensive weight training, however, he was able to strengthen his ankle muscles to give him better balance and mobility. He also strengthened the muscles in his legs and, today, can actually run quickly on them. Football doesn’t pay the bills, however, so to make ends meet Saming works as a parking lot attendant at a local restaurant, living off a small salary, tips and donated food. Despite his challenges, Saming remains upbeat and positive and serves as a role model to people in similar conditions. 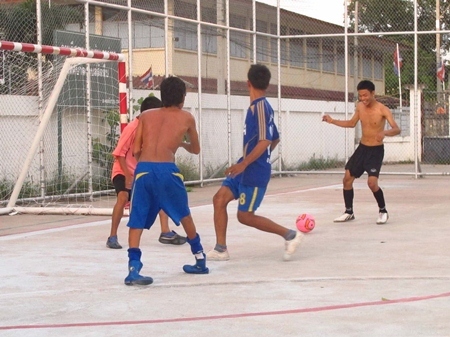 Despite his condition, Saming Thongsupan is a regular fixture on the football pitches at the Taothan and Thepprasit temples.